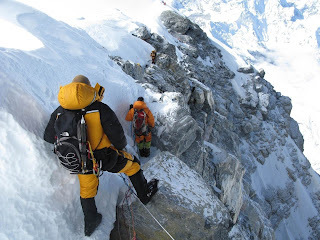 Scaling Mount Everest Summit, is every Trekkers, Every Mountaineers dream.. But it takes lots of preparation, team work, strategy, equipment and gear; and tons of Will Power to do it. South Col Route up Mt. Everest. 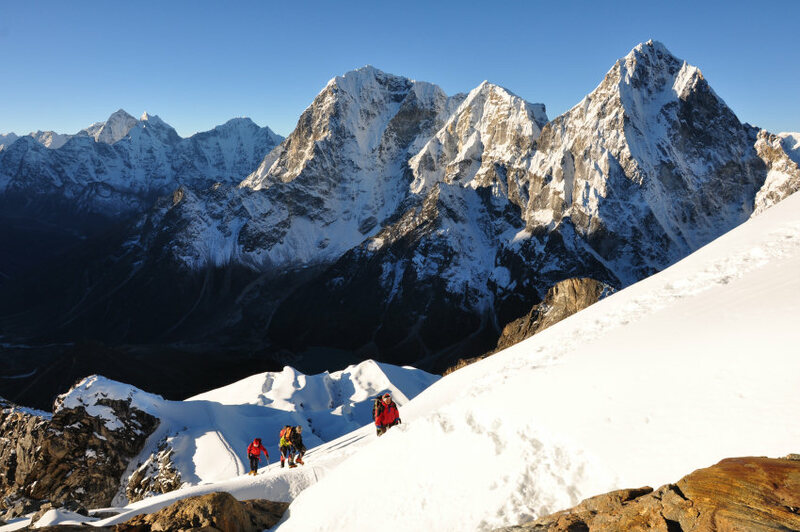 Base camp is located at 17,500 feet and it the most popular route to Summit of Highest Mountain Peak in the World. This is where climbers begin their true trip up the mountain. This is also where support staff often remain to monitor the expeditions and provide medical assistance when necessary. Many organizations offer hiking trips which just go to base camp as the trip is not technically challenging (though you must be very fit). As you’re leaving C4…it’s a little bit of a down slope, with the uphill side to the left. There are typically snow on the ledges to walk down on, interspersed with rock, along with some fixed rope. The problem with the rope is that the anchors are bad, and there’s not much holding the rope and a fall could be serious. Fortunately it’s not too steep, but there is a ton of exposure and people are usually tired when walking down from camp. The rock is a little down sloping to the right as well, and with crampons on, it can be bit tricky with any kind of wind. There’s a little short slope on reliable snow which leads to the top of the Geneva Spur, and the wind pressure gradient across the spur can increase there as you’re getting set up for the rappel. Wearing an oxygen mask here can create some footing issues during the rappel, because it’s impossible to see over the mask and down to the feet. For that reason, some people choose to leave Camp 4 without gas, as it’s easier to keep moving down the Spur when it’s important to see all the small rock steps and where the old feet are going. Navigating down through all of the spaghetti of fixed ropes is a bit of a challenge, especially with mush for brains at that point. One lands on some lower ledges which aren’t so steep, where fixed ropes through here are solid. At this point, it’s just a matter of staying upright, and usually, the wind has died significantly after dropping off the Spur. The route turns hard to the left onto the snowfield that leads to the top of the Yellow Bands. The return trip can be even more dangerous than the climb to the summit. Dec 1st to Dec 16, 2012. (share it with your friends who may be interested in off-beat eco-adventure).